Patients who are considering dentures typically have a lot of questions about the procedure, as well as extraction services and how best to care for their new appliances. For your convenience we have gathered some of the questions we hear most often from our patients and provided the answers here. Take a moment to read them to find the information you need. Have a question that is not addressed here? Contact our office to learn more. Click on any of the following headings to jump directly to that question and answer. Why Do I Need a Denturist? Do Implant-Supported Dentures Require Surgery? What is the Implant-Supported Denture Process? Do I Still Need an Annual Exam After Getting Dentures? How Should I Clean and Care for My Dentures or Partials? Will I Require Tooth Extractions Before Receiving Dentures? Denturists are the only dental professional that is specially trained in both clinical and laboratory procedures. Denturists are experts in the design, construction, placement and adjustment of removable dentures, as well as overdentures on implants. Unlike a general dentist, your denturist will personally oversee or complete every step of your treatment, from taking an impression of your teeth to the final adjustment of your prosthesis. Unlike a conventional denture, which simply rests on the gums without additional support, an implant-supported denture is supported by and attached to implants. These implants are typically placed in the lower jaw because the upper jaw bone structure provides a more stable surface for the denture to rest upon. However, implant-supported dentures can be placed in either the upper or the lower jaw. Like regular dentures, an implant-supported denture should be removed daily for cleaning and again at night when you are ready to sleep. Fixed crowns and bridgework that do not need to be removed are also available. Talk to your denturist to learn more about fixed and removable denture options. The implant-supported denture process requires two surgeries, the first to place the implants in the jawbone under your gums. The second surgery typically takes place three to six months after the first and is used to expose the tops of the implants so that the denture can be attached. Some denturists are now offering a one-stage surgical procedure and the reported success rate is high. Your denturist can help you decide if this procedure is right for your needs. The implant-supported denture process consists of an initial consultation with your denturist to decide on the type of denture that is right for you, followed by surgery to place the implants in your jawbone. Once you lose a tooth or teeth, you also begin to lose bone in the affected area. Most patients, even those with many or all of their teeth missing, have more bone available in the front of the jaw than in the back. While the affected area is healing, a denture is being crafted and customized to fit your mouth. Usually a temporary denture is provided for you to use during this time. An additional surgery takes place about six months after the first so that the implants can be exposed and are ready to have the implant-supported denture affixed. Prior to performing any work, your denturist will schedule an initial consultation with you to discuss the process, review your medical and dental histories, have X-rays taken, and create impressions of your teeth and gums so that your custom denture can be constructed. Your denturist may also require a Computed Topography (CT) scan to identify the location of sinuses and nerves and to ensure that they are not affected by the implant placement. The CT scan will also let the denturist know how much jaw bone is still available and where the implant should be located to provide effective support. If you do not currently wear a denture you will be fitted with a temporary denture to wear until your mouth has had time to heal and the implant-supported denture is ready for placement. This usually requires about four visits and a timeline of several weeks. The temporary denture is subsequently used as a guide by the denturist to help place the implants in the proper positions. The life expectancy of your denture will vary and is dependent upon factors such as your own tolerance levels, lifestyle and eating habits, how long you have been a denture wearer, and other variables. Dentures typically remain effective for a period of five to seven years, but keep in mind that time and use will cause your appliance to experience wear and develop stains, so it is important to maintain a regular cleaning regimen and have repairs and relines performed when needed. Yes! An ill-fitting or worn denture can cause damage to mouth tissues without your even being aware of it. Regularly scheduled dental examinations provide the opportunity to identify problems and potential problems early so that they can be corrected. If mouth tissues are kept healthy your dentures are likely to continue to fit correctly and shrinkage of supporting bone and tissue is minimized. Regular checkups not only allow your denturist the opportunity to check for looseness, inflammation or tissue changes, they also allow you to continue to enjoy all the benefits of a well-fitting, quality denture. Just like natural teeth, dentures should be cleaned after every meal, or if that is not practical, as soon as possible after eating. Hold your denture with your thumb and forefinger while cleaning it and do it over a folded towel or a sink full of water so that it will not break if you accidentally drop it. Brush the appliance using a commercial denture cleaner or household detergent in tandem with a soft-bristled toothbrush or a denture brush. Do not use regular toothpaste, as many of them contain abrasives. For more information about cleaning and caring for your dentures, please visit our Denture Care Tips page. Possibly. If your denturist determines that you would best benefit from a full denture but you still have one or more natural teeth present in your mouth, it may be necessary to extract those remaining teeth. 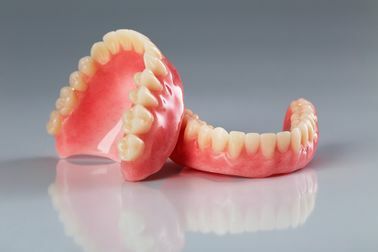 Likewise, if particular teeth are found to be unsuitable for restoration a partial denture may serve your needs after the affected tooth or teeth have been removed. Tooth extractions are typically safe and routine, but we understand you will have concerns, and may be anxious about the procedure. That’s normal. Prior to performing the extraction(s) we will go over the procedure with you so that you know what to expect and have an opportunity to have all of your questions answered.